Industrial shelving comes in several varieties from rivet shelving that locks together to bolt-up shelving that requires tools for assembly. 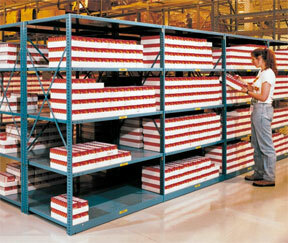 Alternate shelving styles include Rota-bins, aluminum, mobile aisle and high-density shelf storage. You can also choose from open shelving with no sides to closed shelving that has side and back panels. Choose from brands like Penco, Western Pacific, Nashville Wire, Rousseau, Hallowell and Quantum Storage. All well recognized national brands that Cisco-Eagle partners with to provide the best industrial shelving available. The selection includes wire shelving, steel shelving, bin shelving, and shelving with drawers. No matter your shelving needs, Cisco-Eagle probably has what you want.